We are glad to let you know that our promo “Insurance against Stop Out” has been prolonged for 3 more months. Protect your deposit against failed trades with the help of unique insurance from “FreshForex”! If you already use this promotion, insurance will still have effect and payout in case of Stop Out will be conducted in the same terms. You still haven’t activated “Insurance”? Think about Stop Out with a fear? 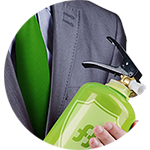 “FreshForex” gives you an excellent opportunity to trade with a freedom and confidence. Just activate a unique promotion and you will have 5 chance to get your deposit back! How to obtain the insurance? 4. Trade at a profit! Please study detailed terms of the promotion prior to taking part in it.